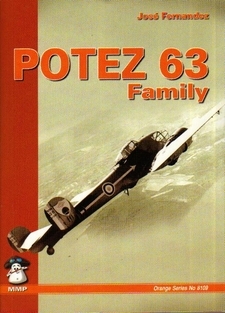 This book from the MMP Orange Series contains a very effective history of the Potez 63 family of twin engine multi-role aircraft that entered French service before the outbreak of war in 1939 and served in a number of other air forces. This book from the MMP Orange Series contains a very effective history of the Potez 63 family of twin engine multi-role aircraft that entered French service before the outbreak of war in 1939 and served in a number of other air forces. The book is lavishly illustrated with photographs, line drawings and colour sketches. Also inserted into the book is a 1/72 scale folded line drawing of the Potez 63 family with a detailed cutaway drawing on the reverse side of the Potez 63-11. A second insert is a flier for the Azur series of plastic kits of the Potez 63. The publishing company is associated with a number of other companies that includes MPM Production model kits, specializing in limited production runs of historic aircraft, using a variety of moulding techniques that produce cost effective limited product runs. As with all MMP and Status publications, the model aircraft constructor is a prime target reader, but the titles published have also developed to provide detailed histories of the subjects with high quality illustration that will appeal equally to aviation historians and aviation enthusiasts. There is a bias towards producing books with a French connection and this provides coverage of aircraft that have received little or no coverage in English language histories. This is a first class historical study of an aircraft that typified the 1930s fashion for twin engine monoplanes that could be used as bombers, reconnaissance aircraft and heavy fighters.